The wildlife you see whilst out and about is without a doubt our real national treasure. These species were here a long time before us or any of our man-made national treasure and this is an important reason why we need to preserve them and stop them suffering due to wildlife crime. This was illustrated with the first talk of the day by Broadcaster and Naturalist, Chris Packham. 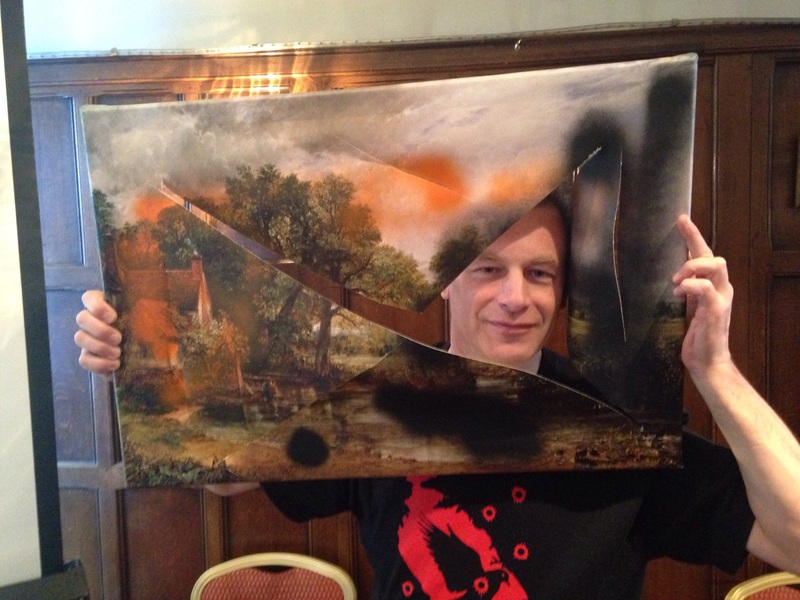 He destroyed a copy of a George Constable painting by attacking it with spray paint and tearing it apart. A painting by the artist George Constable is considered a national treasure and if someone was to destroy the original painting they’d be considered to have destroyed a national treasure. Due to this there would be all sorts of havoc. It would most definitely be top headlines on the news, in newspapers, online and the offender would get into serious trouble. But what about those people who go out and destroy the British countryside by killing species within it, surely they should be getting the same punishment however this isn’t the case. Yesterday I attended the Birders Against Wildlife Crime ‘Eyes in the Field’ conference in Buxton, Derbyshire. I arrived at about 8.20 and straight away I was able to engage with like minded people. This theme carried on throughout the day as I spoke to plenty of fantastic people and listened to a variety of inspirational and interesting talks. To pick a favourite talk would be impossible as they were all very good and including a range of important topics, from policing and the public engagement to investigations and politics. After the talk by Chris Packham it was then onto the next one from CEO Badger Trust and Policy Advisor Care for the Wild, Dominic Dyer. He spoke about the badger cull and his recent meeting with the Environmental Secretary, Liz Truss which was very interesting and you can read more about it by clicking here. I found his talk very interesting as I feel very passionate about badgers and I am strongly against the suffering they put up with including the cull. I’m really looking forward to helping out with badger vaccinating soon. Next it was a talk about bats, how they suffer from wildlife crime and the laws to do with them. This talk was given by Malcom Hopton from Derbyshire Bat Conservation. Again I found this talk very enjoyable, as in the past I have done conservation work for bats which included going out with the East Staffordshire Bat Group and monitoring the bats at one of my local patches, Cannock Chase. After the morning coffee break the day resumed with talks from two different investigation officers. One was Bob Elliot who is Head of Investigations for the RSPB and the other was Paul Tillsley who is Head of Investigations for the League Against Cruel Sports. These two talks were a real eye opener about wildlife crime as they made me realise how serious it is and how some people can be so evil against our national treasures. They both spoke about different case studies along with methods wildlife criminals use and how both organisations help to stop and solve wildlife crimes. They also gave an important message about how we all must remember to report wildlife crimes as if it wasn’t for people like you and me reporting them then they wouldn’t be able to stop the criminals committing their crimes. It was then time for lunch and during the lunch break all the people who had attended, including the speakers all made their way to the front of the hotel to have a photo with the new Birders Against Wildlife Crime Hen Harrier Day banner. The Hen Harrier is a bird that has suffered incredibly from wildlife crime and due to this they have been pushed to near extinction in England. There are a number of different things that you can do to help our hen harriers, one of them is by voting for it for the National Bird and you can do so by clicking here. Here’s the photo and there you can see Henry the Hen Harrier! After lunch, the afternoon started off with three different talks about wildlife crime and the police. As you can imagine this was a very important and interesting start to the afternoon. Obviously without the police we wouldn’t be able to punish the criminals who commit crimes against wildlife. The first talk was by Craig Fellows and he spoke about police wildlife crime training which was very interesting and similar to the local meetings that I attend about wildlife crime and strategies they undertake in my area to deal with wildlife crime. The next talk went against this slightly as Ruth Tingay spoke about the failure of wildlife crime enforcement in Scotland. The final talk of this part was by Alan Charles who was the Derbyshire Police and Crime Commissioner. Like the others, his talk was very interesting and he spoke about how his force is dealing with wildlife crime. It was then onto the last group of talks for the day which were about politics and public engagement. It consisted of two talks, one from Chris Williamson who is the North Derbyshire Labour MP and the other from conservationist Mark Avery. These talks were both very engaging and between them they spoke about a range of subjects from the Badger Cull to Hen Harrier Day 2015. Chris Williamson was another passionate speaker who shared some great stories about his times out with the hunt saboteurs. So was Mark Avery who spoke about Hen Harrier Day 2015, which I’m very much looking forward to! As you can see Saturday was a very inspirational day for me, it was also very important. As I stated at the start we need to preserve and stop our real national treasures from being destroyed. With help from enough people like those who I met on Saturday we can do that. After the conference I realised how those wildlife criminals, pro-hunting politicians etc have no chance and we will win. Great blog Georgia! See you at #BAWC16, if not before. Wasn’t it just! Can’t wait for next year! Pingback: Badger Trust Seminar 2015 | Georgia's Wildlife Watch.